The Southern Terminus of the Trail, Spring Mountain, Georgia. We would be following these little white blazes for the next 177 days. The Professor has a starring contest with a fellow bearded fellow. 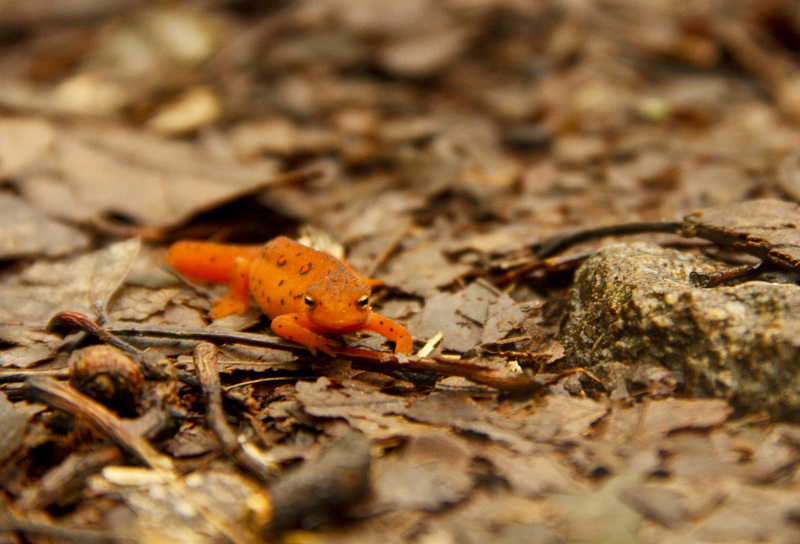 The Red Eft is a common passenger on the trail after a rainy day. Beer Grylls may have been older but he moved like a man on a mission. The Smokie Mountains at dusk. Road crossing at the trail head that takes you to Mt. Rodgers, the highest point in the state of Virginia. This shelter's resident lizard wasn't to happy to see us invade his home. Sometimes we shared the trail with some larger residents. The AT passes through many miles of private pasture lands. Long John finding his rhythm through the rocky terrain of Pennsylvania. Any swimming hole was a welcome relief from the routine. Prime hammock relastate in the vicinity of Sun Fish Pond, NJ. Wallkill River National Wildlife Refuge. Sussex, NJ. Blue Blazes marked side trails off the AT to shelters, water sources, and a variety of sites to see. Welcome to the White Mountains, New Hampshire! Rock hopping on the Lake of the Clouds, below Mt. Washington. Sunset through the trees of Maine. This open field filled with fog made for a surreal and tranquil morning. Ghost Smoke taking in the view from the Horn. One of the many river crossings on the home stretch, the 100 Mile Wilderness of Maine. The bridge to the Hunt Trail, road to the summit. Samson Thee Herbalist caught up in the moment of fulfilling a dream on Mt. Katahdin. The northern terminus of the Appalachian Trail. 2,184.7 miles and growing.